The 2017 racing season has started, with the 61 Kartway Spring Challenge in Delmar, IA. The sprint kart was prepped with the freshened LO206 motor and loaded in to the trailer for a weekend. Both crew and driver were very rusty, the kart was on the track for practice on Saturday night only gear changes were made just to start the kart tuning. Once again, I made the mistake of not really checking my notes, so did not make many changes to the rest of the setup. While we were ahead for Sunday’s racing, the kart was not quite up to speed yet. 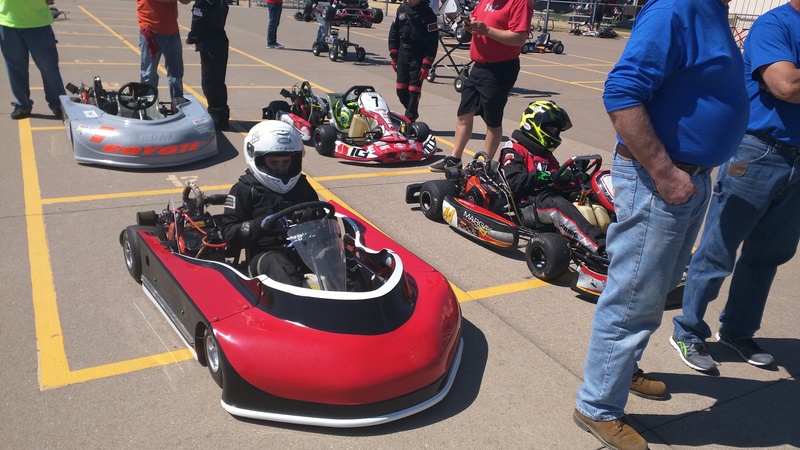 During the first practice runs the kart was 5-6 seconds off the pace, after making some adjustments that did not do it, I looked at my notes and got the kart close to the required lap times but we had a few set backs during racing. Everyone on the team was a bit rusty. Heat 1 he was able to keep up with the leader but not make any moves, the kart was still a little off. With some tuning he for Heat 2 he made progress and had 2nd place in hand until he was forced off the track while fending off a pass. He started the feature in 4th and was able to make some great moves in a four wide start jumping up to second. He stayed there until one of the rear wheel hubs loosened and moved in and stuck the tire against the frame ending his race early. Despite all that, it was a fun weekend and felt good to be back at the track. We made a good effort to bring the 1991 Margay into working condition but it was simply not the right chassis for 4 cycle racing, not enough room for the big motor between the rails. With a hot tip from 4 Cycle Central’s Regan we headed out to purchased this P4 road kart, it had everything we needed and was mostly set up. We should have some neighborhood test runs soon. It will first hit the track May 13-14 at Gateway Motorsports Park with the Championship Enduro Series, we are both pretty excited about putting this kart through is paces and getting the sprint kart back on the big track. This should be a good season if we can keep everything put together.